Malware attacks via phishing knocked it out of the park in 2018. Phishing attacks account for an inordinate number of the data breaches and compromised networks. In fact, the Identity Theft Resource Center (ITRC) reported that “one-third of all security incidents last year began with a phishing email.” As the cyberattacks get sneakier, everyone – workforce and consumers – are at ever-higher risk of breaching data privacy and security. Conduct penetration testing, aka pen testing. Pen testers employ the same tactics as hackers, but to your benefit. You’ll discover how effective your firewalls and patches are as well as how well your workforce “gets” anti-phishing training. Conduct phishing-specific training. Human error continues to be a big gap in privacy and security effectiveness. One click or tap on a link or attachment opens the gate to phishing malware. Scenario-specific, interactive, out-of-the-box training sessions make the biggest difference. Stay on top of the latest phishing and smishing (mobile device phishing via text) techniques so you can take measures to prevent systems infiltration as well as keep your workforce alerted. Encourage transparency internally and externally. Whether it’s an employee who opened the backdoor or a third party partner, you need to know when security has been breached. Promote admitting, “I may have messed up” and what to do the second it happens (aka per security incident response). Keep anti-virus, anti-spam and anti-spyware software current. Hackers are smart cookies but if you’re not on top of essential technology safeguards, they don’t even have to try. If we were going to choose one tech tip and one human error prevention tip to focus on in Q1, we’d select pen testing and anti-phishing training. One pen testing researcher is so intent on lighting a fire against phishing that he published his scarily successful pen test. And should all prevention measures fail, you’ll need backup. Which brings us to: Keep recent backup system copies readily accessible. 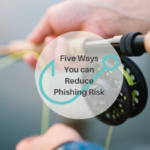 If phishing does get through, you’ll want to be able to quickly go back to a “safe” backup so you can get operations back up and running. With response measures in place, the sooner you know, the faster you can act.